We’ve always wanted body armor to look less like a chunky Kevlar vest and more like a sleek superhero suit. The Army wants that too, enough so that it just awarded a $100,000 contract to a company to see if its genetically engineered spider silk can be used for body armor. If all goes well and the material looks promising, the contract could be extended up to $1 million, and the rest of us can prepare for the coolest body armor known to man. It’s important to note, however, that these spider silk—or, as Kraig calls them, “dragon silk”—suits might not be the strongest suits known to man. Existing body armor is usually made of Kevlar and dragon silk is only two-thirds as strong, though pure dragon silk would be stronger than Kevlar. But Kevlar is also super bulky and limited to protecting only the torso, while dragon silk retains strength while being far more flexible. This leads not only to wider range of motion but also opens up the possibility of a full-body suit and more protection. Scientists have long known that spider silk is basically a miracle material. It’s five times stronger than steel of the same diameter, waterproof, and thanks to protein threads that serve as stretchy “superstrings,” it can be stretched up to 40 percent without breaking. It’s even inspired the creation of a liquid wire and could be used to grow replacement hearts. Problem is, it’s hard to produce. We have millennia of experience raising silkworms on farms, but nobody really wants to have a spider farm. That’s not only because spiders are creepy. Arachnids are also cannibalistic and hard to work with, making spider silk incredibly rare. Some scientists are tackling the problem by spinning limited amounts of artificial silk in a lab, but the folks at Kraig inserted spider DNA into silkworms to make them spin a spider silk-like material. But don’t you wonder what would happen if one of those silkworms bit someone? 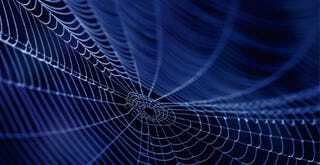 Do mutant silkworms have the same effect on humans as radioactive spiders? We might soon find out.